Holt & Heath Wooden Treenware: What is it.....? This is the question that has been asked by anyone who has seen this most recent bit of carving, and the answer is....well, I don't really know. 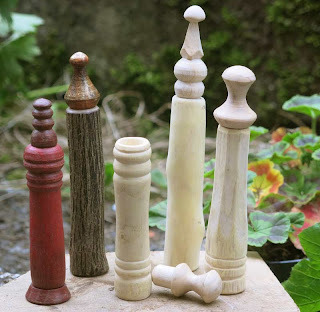 I wanted to do some whittling and had seen some lovely containers on Sean Helman's most recent post and thought I might have a go at something like that. He calls his needle cases and I'm guessing, though I can't be sure due to there being nothing to reference them against in the photo, that his are somewhat smaller than mine - and I hasten to add more delicate. I guess ultimately mine was just a bit of fun. The first one I tried, I carved the outside shape first, then tried to drill out the centre using a flate spade bit in an electric drill with it held in a bench vice. Suffice it to say, I ended up drilling through the wall of the box, which split in the process anyway. Those spade bits just can't handle green wood. A complete and utter waste of time. This second one I roughed first, then drilled out with an auger (I thought I would have more control using this - plus it always amazes me just how efficiently it works), held in my trusty leg vice (.99p from ebay). I love this vice and though it is old and weighs a ton, I use it a lot when making spoons. I bought it originally with the intention of fixing it to the side of my portable chopping stump but when I realised how huge it was, thought I would wait to attatch it to something more permanent, but haven't gotten round to it yet. Then I carved the outside and painted with acrylic paints. It was not the easiest carving I've ever done - in fact it was hard wood and hard carving. The star was a beggar and then under-cutting it to do the ball, without snapping it off, was the devil of a job. My fingers were pretty chewed up by the time I'd finished and I still don't really know what it is! I guess I really should ask Sean for the size and method used on his cases. Nice job, I thought that needle cases would have given you some idea of size, but there again maybe you thought knitting needles. Yours is somewhat larger, to say the least. I used a 12 or 15 mm drill bit on mine. Some are turned on the lathe and some hand carved. The depth of the hole is about 70 or 80 mm deep and total height of about 140mm. Great job on the star, that must have taken a bit of time. I would have carved a separate one, drilled a couple of holes and whittled an ash stick. Hi Sean, you know, as I wrote the post I thought the clue was probably in the name. Plus, one looks like it has the bark on still so must have been made from a branch, not from a section of trunk, as mine was so, again, something of a give away. Either way, I really like your NEEDLE cases and will perhaps have a go at a couple myself.